CSS supported four sessions held by the EPA Region 6 Superfund Technical Assessment and Response Team (START) in its Border 2012 U.S.-Mexico Environmental Program efforts. Border 2012, a collaboration between the U.S. and Mexico, focuses on clean air, safe drinking water, reducing the risk of exposure to hazardous waste and improving emergency preparedness along the U.S.-Mexico border. CSS personnel inspected and inventoried emergency response equipment and supplies donated by NORTHCOM for Mexican Sister Cities; recommended additional equipment to EPA for NORTHCOM to purchase; developed and executed Border Technical Training, including Hazardous Materials (HAZMAT) Technician-Level training; and identified additional equipment and supplies needed to supplement current equipment donations. A total of 119 emergency response personnel attended the Border HAZMAT Technician-Level Training sessions. 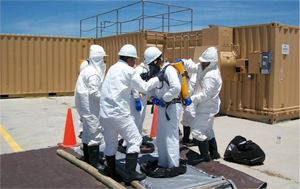 CSS delivered the Technical HAZMAT training courses and led the exercises and field demonstrations. Our personnel developed equipment Quick Start Guides (QSGs) for the students, who were trained how to properly utilize equipment and supplies donated and provided by NORTHCOM. The five-day training culminated with a full-scale exercise to enable the students to practice skills learned during the training. Equipment transfers were recognized during a ceremony at each training location attended by bi-national agency guests.